Override default Joomla template for mobile devices. This plugin is so easy to use: just install and publish it, then select which template you want to use on mobile devices, save, and you are ready. This plugin works on both side, frontend and backend? No, since the 1.3.0 version this plugin works just on frontend, so you can login to your admin with the default admin template also from mobile devices. The switch depends from the screen sizes? No, the template swich is triggered by the device used to browse the site. Why in selected mobile template any module is visible? Please remember that often templates have different module positions and the names are not the same. So if you have a menu published in the main template in a position called "main-menu" you should duplicate the module and publish the copy in the right module position of selected mobile template, because maybe it doesn't have the module position called "main-menu". 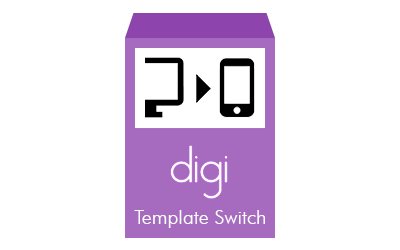 System name changed from "plg_digi_template_switch" to "digi_template_switch"
Perfect, it switch my template for mobile devices. Functionality: Very easy, after installation of the plugin, I have just selected the mobile template I wanted for mobile devices, that's it! Ease of use: Very easy, as is written above, just one step after installation to have the template switched. Support: The developer is present for the support. Documentation: On the product page is written how to use this plugin, but is very easy to use so documentation is not needed. I used this to: I use this to switch the template on my Joomla website for mobile devices. Now I got a new template to use by smartphones, as my current one is a bit old, but I don't want to change it for now. The best way to switch between two Joomla! templates one desktop and one mobile. Functionality: It does what it has to do. I have selected my mobile template from the list in the plugin, and now I see the new template by my smartphone. Ease of use: Very easy, because I had only to select what template I want to use for mobile browsing. Support: I ask for a question and I received an answer after only 5 hours, even if this extension is free. Documentation: I don't think documentation is needed for this simple and user friendly extension. I used this to: I use this plugin to switch the template of my Joomla! website when it is browsed by a mobile device such as a smartphone or a tablet. All is ok for now. Thanks for this extension is very helpful.